Australians that want to participate in BOINC and give a definite Aussie Presence. Australians world wide are welcome and encouraged to join the #1 Aussie Alliance. As the song goes: Come on Aussie come on, come on. BOINC@AUSTRALIA has a team in all the BOINC projects. but anyone is welcome to join. BOINC is a program that runs in the background on you computer and uses your computing power when you aren't. It allows you to contribute to many different scientific (and some not so scientific) projects with a general aim to better the knowledge of mankind. and even search for aliens (where it all began with SETI). So why not start doing something with your computer's idle time? Have a look at our website by clicking on the Team Logo above. We also have a forum where members can find out information and ask questions about projects or just about anything. You too can join the millions of other people around the world making a difference by turning their computers into part of a huge SUPERCOMPUTER! A huge thank you to WangNET for hosting both the Team Forum an web page. Most computers are equipped with a Graphics Processing Unit (GPU) that handles their graphical output, including the 3-D animated graphics used in computer games. The computing power of GPUs has increased rapidly, and they are now often much faster than the computer's main processor, or CPU. Some BOINC-based projects have applications that run on GPUs. These applications run from 2X to 10X faster than the CPU-only version. Join World Community Grid as a starting project. You can join a team and become part of a fun community doing a little bit of science along the way! If you have any questions send me a message to the email address at the button on this page. If you would like to contribute your computer time to a project. Try World Community Grid which has a range of different projects to pick from. If you already participate in the World Community Grid, Click HERE to start Distributing Computing. All you then need to do to join the BOINC@AUSTRALIA team on the page that appears. If you have not yet joined World Community Grid, Click HERE to start Distributing Computing. ;When you register, the team will be automatically selected for you. You will still need to download and install the World Community Grid software. 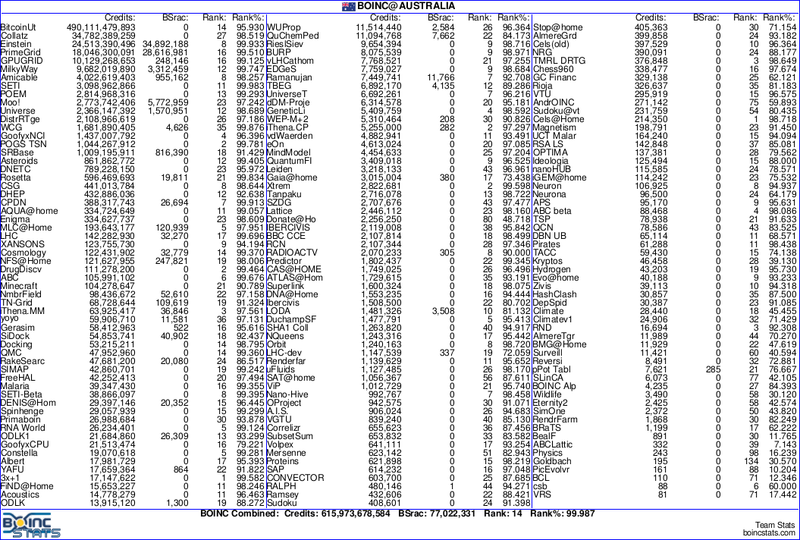 Below are the Stats for all the projects that BOINC@AUSTRALIA participates in. We are the #1 in Australia and reaching for top 10 in the world. of the information, nor for any consequence of its use.